Fresh Cup spoke with various coffee industry professionals at the 2018 Golden Bean North America competition and conference, which commenced September 19–22 in Portland. Over the next week, we’ll be sharing their stories. For more of Fresh Cup’s Golden Bean coverage, including behind-the-scenes photos and a list of winners, click here. A newcomer to the coffee industry, Carlos Carneiro changed career paths late in life. He spent 30 years in the mining industry in Brazil, and now owns Coffee Unite, a green bean importer based in Miami, Florida. 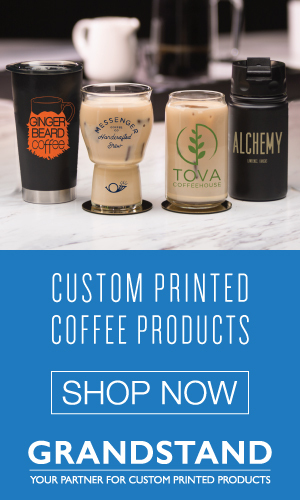 Carneiro holds a special connection to his product as the beans are grown by his friends and business partners in Sao Paolo, Brazil, or purchased directly from neighboring specialty coffee farms. This was Carneiro’s first year attending Golden Bean North America, as well as his company’s first time sponsoring the event. JJ: What has your experience at Golden Bean been like so far? CC: I’ve made a lot of good contacts, which is the main purpose of my visit here. 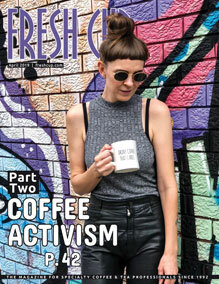 I spoke with people from the industry, on all different levels, so roasters mainly, which is my target of course, but I’ve also spoken with equipment manufacturers, with social media, with other green bean sellers, so it has been very positive. JJ: What do you hope happens for Coffee Unite by coming to Golden Bean and by being a sponsor of Golden Bean? CC: To be at Golden Bean as a sponsor, we hope to expose our brand, to be known more and more every time we have an opportunity like this, at Golden Bean where key roasters are present. Of course I expect to make some contacts and sell some coffee as well to these roasters. 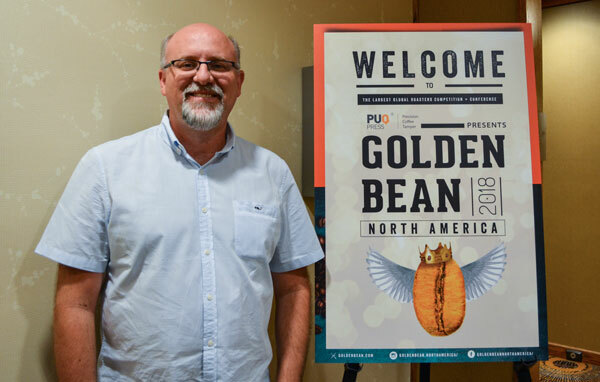 Carlos at Golden Bean North America 2018. JJ: Do you feel like you’re developing great connections with roasters? Are you meeting a lot of roasters here? CC: Yes, I’ve met a handful of roasters that showed interest in buying Brazilian coffees. They want to receive samples, they liked to connect. So that is important. I have the hope that some of them will actually buy coffee from us. So yes, it was very successful in that respect for the couple of days being here. JJ: Do you think you’ll come back to Golden Bean? CC: Yes, positively. Next year I will look forward to coming back to Golden Bean. That is what I’m preparing for and expecting. 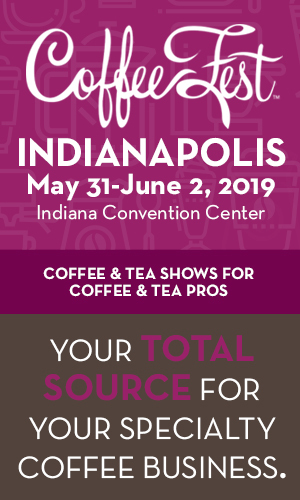 I will be a larger business, and then I will have more resources to have my own booth with some of my coffees there, and have my name be more well known by the roasters that come to the event. So yes, definitely. JJ: What’s your personal reason for getting into the coffee industry? CC: First, the main reason was that I love coffee. I worked for many years in a totally different industry, in the mining industry, and for almost 30 years of my life. When I decided to change, to do something different with it, to have my own business, the first thing that came to my mind was to unite a love that I have, and passion that I have for coffee with an opportunity that I had, which was having friends that were coffee growers. 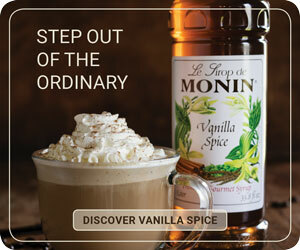 Uniting these ideas, I came up with the concept of doing the direct trade and bringing coffee to the US. JJ: What makes Brazilian coffees really special? CC: Brazilian coffees are mostly well known for their blend, strong characteristics. So they are very sweet, they are low acidity, they have flavors like dark chocolate, nutty flavors, and caramel, which are all very nice for the blends, for the flavors. People usually like this type of coffee for regular daily coffee. So this is the number one strong point of Brazilian coffees, but we also have exotic coffees, we have coffees from so many different regions in Brazil which have different kinds, different terroirs, even some shade-grown coffees. We have even a coffee that is really exotic that comes from a bird that eats the cherries and the coffee is then collected and sold like the kopi coffee from Indonesia like the civet, but the process is the same, and you can find that coffee in Brazil. You can find a lot of interest in coffee there. We have volcanic regions in the south of Brazil, and because the soil is volcanic, it has very similar characteristics to the Ethiopian qualities, so in those regions you find more fruity, floral, really interesting and complex coffees that are totally different from the regular brand we have as “Brazilian coffees.” So our target is to bring coffees from all different regions so that we can offer this range of experiences to clients in the US.